A very nice condition Junior vacumatic fountain pen in silver pearl from 1945; the pen has a very nice single-colour fine grade 14ct gold nib and writes nicely. 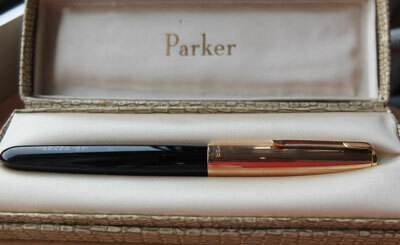 A Parker Centennial fountain pen in black with gold-filled trim; it has not been used much so is in lovely condition; the pen has a broad grade 18ct gold nib and writes nicely. An immaculate Centennial/International ballpoint pen in blue and black marble with gold-plated trim and boxed too. A beautiful-condition mint uninked 51 fountain pen in black with a gold-filled cap; this pen has NOT been used so is in lovely condition and will last for years; the pen is a squeezy-filler; the pen has a medium grade 14ct gold nib. A beautiful-condition 51 fountain pen in burgundy with a lustaloy cap; this pen has been used but is in lovely condition and will last for years; the pen is a squeezy-filler; the pen has a medium grade 14ct gold nib. A 61 Flighter fountain pen and pencil set in brushed steel with a gold-filled clip; this set has been used but is in lovely condition and will last for years; the pen is a cartridge or converter-fill and has a converter fitted; the pen has a medium grade 14ct gold nib and writes nicely; boxed too. A 61 fountain pen in black with a gold-filled Consort cap and clip; this pen has been used but is in lovely condition and will last for years; the pen is a cartridge or converter-fill and has a converter fitted; the pen has a medium grade 14ct gold nib and writes nicely. A 61 fountain pen in black with a gold-filled cap and clip; this pen has been used but is in lovely condition and will last for years; the pen is a cartridge or converter-fill and has a converter fitted; the pen has a medium grade 14ct gold nib and writes nicely. A lovely condition Whitefriars glass desk bal with a Parker 51 fountain pen located in the 'tulip' on the top; the pen has a medium grade 14ct gold nib and writes nicely. A lovely condition Parker 51 Desk Set Model 8711 comprising a green onyx desk base with a Parker 51 fountain pen located in the 'tulip' on the top; the pen has a medium grade 14ct gold nib and writes nicely. A beautiful-condition 51 fountain pen in burgundy with a gold-filled cap; this pen has been used but is in lovely condition and will last for years; the pen is a squeezy-filler; the pen has a medium grade 14ct gold nib; boxed too with leaflet. A very nice condition Junior vacumatic fountain pen and pencil set in azure blue pearl from 1945; the pen has a very nice single-colour fine grade 14ct gold nib; the pencil has spare leads and a new eraser. A mint unused Sonnet Accession ballpoint pen in purple finish with 'frosted' gold-filled cap and clip and in immaculate condition. A very nice Maxima Duofold fountain pen and matching pencil in green with gold-filled trim; neither the pen nor the pencil have been used so are in lovely condition; the pen has a lovely medium grade 14ct gold No.50 nib and it writes nicely; this is a big pen and will out-last anything you can buy in the High Street today for 5 times the price. A very nice lightly-used 75 Cisele Vermeil fountain pen in Gold-filled Sterling Silver finish and in a box; the pen has a medium grade 14ct gold nib marked 'M'; the pen uses cartridges or a converter and a converter is fitted; the pen is France made with dimpled ends. A Parker International fountain pen and ballpen set in blue and black marble with gold-filled trim; it has not been used much so is in lovely condition; the pen has a medium grade 18ct gold nib and writes nicely; the ballpen has a new refill. A lovely condition marble or glass desk base with a Parker 51 fountain pen located in the 'tulip' on the top; the pen has a medium grade 14ct gold nib and writes nicely. An almost mint but inked 65 Cirrus fountain pen and ballpen set in immaculate condition; the pen uses cartridges or a converter and there is a converter fitted; this set is in its original box with the outer sleeve. A Lucky Curve Senior Duofold fountain pen and pencil set in red permanite, I think, from the 1920s in good mechanical condition and boxed too; the pen has a broad stub grade 14ct gold nib. A 51 Insignia fountain pen in gold-filled finish and with gold-filled trim; this pen has been used but is in lovely condition and will last for years; the pen is a squeezy-filler; the pen has a medium grade 14ct gold nib; boxed too. A very nice Maxima Duofold in green with gold-filled trim; this pen is very nice with a lovely medium grade 14ct gold No.50 nib and it writes nicely; this is a big pen and will out-last anything you can buy in the High Street today for 5 times the price. A very nice Maxima Duofold in black with gold-filled trim; this pen is very nice with a lovely medium oblique grade 14ct gold No.50 nib and it writes nicely; this is a big pen and will out-last anything you can buy in the High Street today for 5 times the price. A very nice Maxima Duofold in blue with gold-filled trim; this pen is very nice with a lovely fine grade 14ct gold No.50 nib and it writes nicely; this is a big pen and will out-last anything you can buy in the High Street today for 5 times the price. A very nice Duofold in dark chocolate brown with gold-filled trim; this pen is very nice with a lovely very broad grade 14ct gold 'N' nib and it writes nicely; this is a sizeable pen and is a real workhorse of a pen; will last for years. A beautiful mint uninked 180 in gold-plated finish with gold-filled trim and a medium and extra fine grade nib; this pen writes on both sides of the nib and in different grades; the pen dates from 1985 or thereabouts; the feed has M and an X on it. A very nice Duofold in bronze and black marble with gold-filled trim; this pen is very nice with a lovely medium to broad grade 14ct gold nib and it writes nicely; this is a work-horse of a pen and will outlast anything you can buy in the High Street today for 5 times the price. A Parker International fountain pen and pencil set in blue and black marble with gold-filled trim; it has not been used much so is in lovely condition; the pen has a extra fine grade 18ct gold nib and writes nicely; the pencil has spare leads and an unused eraser. A very nice lightly-used 75 Cisele fountain pen in Sterling Silver finish; the pen has a medium oblique grade 14ct gold French nib and uses cartridges or a converter and a converter is fitted; the pen is USA made with flat ends. A very nice Maxima Duofold in black with gold-filled trim; this pen is very nice with a lovely medium grade 14ct gold No.50 nib and it writes nicely; this is a big pen and will out-last anything you can buy in the High Street today for 5 times the price. A very nice Maxima Duofold in red with gold-filled trim; this pen is very nice with a lovely fine grade 14ct gold No.50 nib and it writes nicely; this is a big pen and will out-last anything you can buy in the High Street today for 5 times the price. A 61 fountain pen in burgundy with a gold-filled cap and clip; this pen has been used but is in lovely condition and will last for years; the pen is a cartridge or converter-fill and has a converter fitted; the pen has a medium grade 14ct gold nib and writes nicely; boxed too. A 65 fountain pen in black with a gold-filled cap and clip; this pen has been used but is in lovely condition and will last for years however, the nib has been a bit bent but is good now; the pen is a cartridge or converter-fill and has a converter fitted; the pen has a broad grade 14ct gold nib and writes nicely. Here we have a Parker Senior Duofold Lucky Curve fountain pen in jade green permanite with gold-filled trim and a 14ct gold broadish medium oblique grade nib; this is a very nice one and writes nicely too. A very nice lightly-used 51 aerometric in dark burgundy with a gold-filled cap and clip; the nib is a medium grade 14ct gold; this is a lovely example of a desireable 'work-horse' of a pen. A very nice lightly-used 51 aerometric in burgundy with a gold-filled cap and clip; the nib is a medium grade 14ct gold; this is a lovely example of a desireable 'work-horse' of a pen. A very nice lightly-used 51 aerometric triple set, and boxed, in black with a gold-filled caps and clips; the nib of the pen is a medium grade 14ct gold; this is a lovely example of a desireable 'work-horse' of a pen set. A very nice condition Canadian Junior vacumatic fountain pen in green, black and red marbled finish from 1934 or thereabouts; the pen has a nice single-colour broad oblique grade 14ct gold Vacumatic nib; it writes delightfully. A very nice lightly-used 75 fountain pen in gold-plated Barley finish; the pen has a medium grade 14ct gold nib marked 'M'; the pen uses cartridges or a converter and a converter is fitted; the pen is French made with dimpled ends. A 65 fountain pen in black with a Consort 1/5th 12ct rolled-gold finish cap and a gold-filled clip; this pen has been used but is in lovely condition and will last for years; the pen is a cartridge or converter-fill with a converter fitted; the pen has a fine grade 14ct gold nib and writes nicely. A 61 fountain pen in burgundy with a Consort 1/5th 12ct rolled-gold finish cap and a gold-filled clip; this pen has been used but is in lovely condition and will last for years; the pen is a cartridge or converter-fill with a converter fitted; the pen has a broad oblique grade 14ct gold nib and writes nicely. A very nice, virtually mint but inked, 51 aerometric in teal blue with a rolled-silver cap and gold-filled clip; the nib is a medium grade 14ct gold; this is a lovely example of a desireable 'work-horse' of a pen. A very nice 51 aerometric in forest green with a lustaloy cap and clip; the nib is a fine grade 14ct gold; this is a lovely example of a desireable 'work-horse' of a pen and in a rare colour. A very nice lightly-used 75 Cisele fountain pen in Sterling Silver finish; the pen has a double broad grade 14ct gold nib marked '98'; the pen uses cartridges or a converter and a converter is fitted; the pen is USA made with dimpled ends. A 61 Consort Insignia fountain pen in 1/5th 12ct rolled-gold finish with a gold-filled clip; this pen has been used but is in lovely condition and will last for years; the pen is a cartridge or converter-fill with a converter fitted; the pen has a fine grade 14ct gold nib and writes nicely. A 65 fountain pen in burgundy finish with gold-filled cap and clip; this pen has been used but is in lovely condition and will last for years; the pen is a cartridge or converter-fill with a converter fitted; the pen has a double, or even triple, broad grade 14ct gold nib and writes beautifully, if you like a nib this broad. A 51 fountain pen and ballpen set in black with gold-filled caps and clips; this set has been used but is in lovely condition and will last for years; the pen is a squeezy-filler and has a medium grade 14ct gold nib; the ballpen has a new refill; its boxed too. A 61 Heirloom fountain pen and pencil set in rouge red finish with gold-filled caps and trim; this set has been used but is in lovely condition and will last for years; the pen is a cartridge or converter-fill with a converter fitted; the pen has a medium grade 14ct gold nib; the pencil has spare leads and a new eraser. A very nice 51 aerometric fountain pen and pencil set in burgundy with a lustaloy caps and clips; the nib of the pen is a medium grade 14ct gold; this is a lovely example of a desireable 'work-horse' of a pen and pencil set; they will last for years. A very nice 51 aerometric in black with a gold-filled cap and clip; the nib is a broad oblique grade 14ct gold; this is a lovely example of a desireable 'work-horse' of a pen and will last for years. A 61 Consort Insignia fountain pen in gold-filled finish and with gold-filled trim; this pen has been used but is in lovely condition and will last for years; the pen is a cartridge or converter-fill with a converter fitted; the pen has a medium grade 14ct gold nib. A very nice 51 aerometric fountain pen and ballpen set in black with a gold-filled caps and clips; the nib of the pen is a broad grade 14ct gold; this is a lovely example of a desireable set of fountain pen and ballpen and will last for years; the set is boxed too. A very nice lightly-used 75 Cisele fountain pen in Sterling Silver finish and in a box; the pen has a medium grade 14ct gold nib marked '66'; the pen uses cartridges or a converter and a converter is fitted; the pen is USA made with flat ends. A 65 Insignia fountain pen in gold-filled finish and with gold-filled trim; this pen has been used but is in lovely condition and will last for years; the pen is a cartridge or converter-fill with a converter fitted; the pen has a broad-oblique grade 14ct gold nib. A very nice 51 aerometric in black with a lustaloy cap and clip; the nib is a medium grade 14ct gold; this is a lovely example of a desireable 'work-horse' of a pen and will last for years. A very nice Duofold in black with gold-filled trim; this pen is very nice with a lovely medium grade 14ct gold nib and it writes nicely; this is a work-horse of a pen and will outlast anything you can buy in the High Street today for 5 times the price. A very nice 51 aerometric in forest green with a gold-filled cap and clip; the nib is a medium grade 14ct gold; this is a lovely example of a desireable 'work-horse' of a pen and in a rare colour; the sac is partially see-through so you can see it hasn't been used much. A 61 fountain pen in black with a gold-filled Heirloom cap; this pen has been used but is in lovely condition and will last for years; the pen is a cartridge or converter-fill with a converter fitted; the pen has a medium grade 14ct gold nib. A 65 Flighter de Luxe fountain pen, ballpen, and pencil set in brushed steel with gold-filled clips and the original factory clip tags; the pen has a medium grade 14ct gold nib; the pencil has spare leads and a serviceable eraser. A Lucky Curve Senior Duofold in red hard rubber, I think, from the 1920s in good mechanical condition with a nice medium grade 14ct gold Canadian nib. A very nice 51 aerometric in forest green with a gold-filled cap and clip; the nib is an enormous double-broad oblique grade 14ct gold; this is a lovely example of a desireable 'work-horse' of a pen and in a rare colour. A very nice lightly-used 75 fountain pen in Thuya finish; the pen has a fine grade 14ct gold nib and uses cartridges or a converter and a converter is fitted; the pen is French made with dimpled ends. A beautiful lightly-used 180 in 'Malacite' finish with gold-filled trim and a fine/broad grade nib; the pen dates from 1983 or thereabouts; the feed has F/B on it which means that when writing on one side of the nib it is broad and when writing on the other side it is fine. A hardly-used immaculate-condition Parker 61 18ct gold hall-marked fountain pen in fine barley pattern with 18ct gold hall-marked clip; there are no dings but there are the initials 'BE' on the cartouche; beautiful none-the-less! A very nice condition Oversize vacumatic fountain pen and pencil set in burgundy pearl from 1934, or thereabouts, within its original box; the pen has a very nice two-colour medium-to-broad stub grade 14ct gold nib; the pencil has spare leads and a hardened eraser. A very nice Maxima Duofold in blue with gold-filled trim; this pen is very nice with a lovely double broad grade 14ct gold No.50 nib and it writes nicely; this is a big pen and will out-last anything you can buy in the High Street today for 5 times the price. A 1951 USA made 51 Flighter aerometric fountain pen and pencil set in brushed steel with gold-filled clips and cap bands; the pen has a fine grade 14ct gold nib; the pencil has spare leads and a serviceable eraser. A superb-condition Parker 100 fountain pen in cobalt black with titanium-coated graphite grey cap and a medium grade 18ct gold nib; only made between 2004 and 2007; boxed with outer box. A very nice 51 twin-jewel vacumatic in grey with a gold-filled cap and a fine grade 14ct gold nib; this is a lovely example of a desireable pen, and boxed too. A very nice 51 aerometric in teal blue with a lustaloy cap and a medium oblique grade 14ct gold nib; this is a lovely example of a desireable 'work-horse' of a pen. An immaculate 51 aerometric in plum, yes PLUM, with a gold-filled cap and a medium grade 14ct gold nib; this is a rare pen being 'plum' but even rarer to find one in this superb condition. A very nice 51 fountain pen in midnight blue with a gold-filled cap; the pen is a vacumatic(pump)-filler and has a lovely fine grade 14ct gold nib and writes nicely. A Canada-made Junior Duofold fountain pen in lapis blue permanite from 1929 or thereabouts in good mechanical condition with a nice medium grade slightly-flexible14ct gold nib and two cap bands. A very nice Senior Duofold in blue with gold-filled trim; this pen is very nice with a lovely medium grade 14ct gold No.35 nib and it writes nicely; this is a big pen and will out-last anything you can buy in the High Street today for 5 times the price. 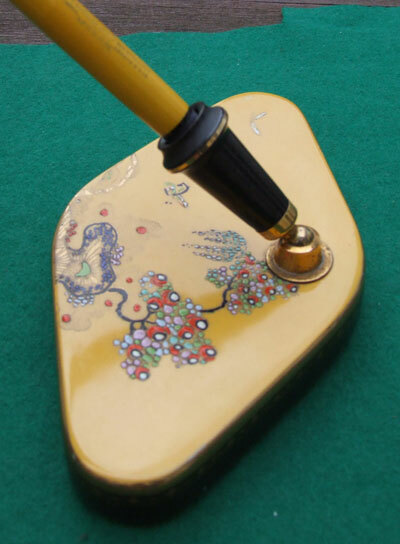 A very nice Duofold pencil in jade green permanite with gold-filled trim; its in working order with no dings to the 'chef's hat' top cap and no serious scratches or marks; the imprint is crisp and the plating is good apart from on the ball of the clip; the eraser is good and there are spare leads. A very nice 51 Mk.2 Classic fountain pen in black with lustaloy cap and chrome-plated clip; the pen is an aerometric(squeezy)-filler and the ink sac is partly see-through; the pen has a fine grade 14ct gold nib. A very nice French-made pen in brown with gold-filled trim; this pen is very nice with a lovely medium grade 18ct gold nib and it writes nicely; I don't think it has ever been used. A beautiful mint uninked 180 in brushed-steel finish with gold-filled trim and a medium grade nib; the pen dates from 1985 or thereabouts; the feed has M on it. An immaculate Centennial ballpoint pen in blue and black marble with gold-plated trim and boxed too with outer box and booklet. A very nice 75 Ciselle fountain pen in 14ct gold-filled finish with gold-plated clip and tassies; the pen has been used but not a lot; pen has a medium grade 14ct gold nib, marked M, and uses cartridges or a converter and a converter is fitted; USA made. A beautiful and very rare Duofold Centennial Snake Limited Edition fountain pen in black with hallmarked silver entwined overlay; the pen is number 1143 in a limited edition of 5000 and comes boxed with all the original paperwork; hard to find are these. A very nice 51 fountain pen and clutch pencil set in black with lustaloy caps and in quite lovely condition; the pen is an aerometric(squeezy)-filler and has a very nice medium grade 14ct gold nib and writes nicely; the pencil is lovely too with spare leads and a new eraser. A Canada-made Lady Duofold in jade green permanite from 1929 or thereabouts in good mechanical condition with a nice broad grade 14ct gold nib and three cap bands; this has darkened a little. 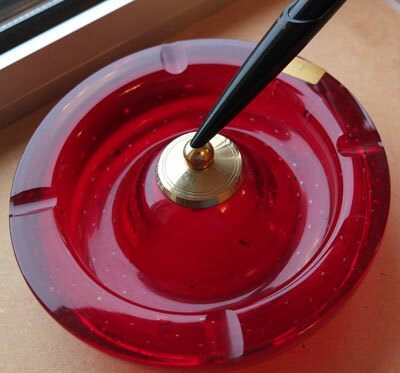 A lovely condition Whitefriars glass desk base with a Parker 51 fountain pen located in the 'tulip' on the top; the pen has a medium grade 14ct gold nib and writes nicely. A beautiful 180 Ecosse in gold-plated finish with gold-filled trim and a fine grade Classic nib; the pen dates from 1985 or thereabouts; the feed has F on it. An almost mint but inked 65 Cumulus fountain pen; the pen uses cartridges or a converter and there is a converter fitted; this is in a box but not the original. A very nice condition Vacuum-Filler fountain pen in burgundy pearl from 1932 with a nice fine grade two-colour 14ct gold nib; these pens are very rare and were only made for 1 year. This pen is known as the Senior but is the size of a Major vacumatic. A very nice condition Junior Vacuum-Filler fountain pen and pencil set in burgundy pearl from 1932 with a nice fine grade two-colour 14ct gold nib; these pens are very rare and were only made for 1 year. A very nice condition Vacuum-Filler fountain pen and pencil set in burgundy pearl from 1932 with a nice fine grade two-colour 14ct gold nib; these pens are very rare and were only made for 1 year. This is the shorter version. A hardly-used 61 9ct gold hall-marked fountain pen in water-drop pattern with 9ct gold hall-marked clip; there are no dings and there are no initials on the cartouche; beautiful ! A very nice Duofold pencil in red permanite with 'JR' on it indicating that its the pencil for the Junior pen; in fact its about a quarter of an inch shorter than a Big Red pen and put alongside a Junior pen it dwarfs it; its in working order with no dings to the 'chef's hat' top cap and no serious scratches or marks; the eraser is good and there are spare leads.